New member looking for help/reassurance??? Current TV is going to be a 2009 Chevrolet Suburban 1500 Z1 4x4 - 5.3l - 6-speed trans, 3.42 (yes I know not as desireable, but the 6-speed helps "counter" this a bit) - going to add in adjustable rear shocks, HD trans cooler, TT brake controller, Steel braided lines (basically the equivalent to the Z82 K5L HD tow package from factory) - I mention this since the GCWR on the burb is 11.5K but with the Z82 the GCWR is 14K... and upgrading to EQ/load hitch. I hate to be a pessimist, but I think you may be expecting too much for 5K. The older the A/S, the more it has been exposed to the elements, that is, water--so the more likely you are to have floor rot issues. Owners who have already dealt with these issues will want more for the unit. The '70s units are light and since are newer than '50s/'60s would probably have correspondingly less water damage. The 31' ft Sovereign rear baths are infamous for frame separation, however, so beware of these models. Have you considered a smaller unit--26', 28'?--and allowing the boys to sleep in a tent outside? In good weather, of course. Or as you mention, rigging bunks. Several threads detail how this has been done. We have a '77 23' Safari with two gauchos which each make out into a narrow double bed. This might work out well for you (except for the "touching" thing! Kids!). 70s prices are not too bad either: less than 50s/60s, and the larger units (26-28') have less "cute factor" and so less market value, in general. Those are my opinions but I am no expert--prices and availability vary from region to region. Are you aware that many Forum members will look at and evaluate a trailer for a distant prospective buyer? Best of luck--your goals are certainly worth working toward. Yes I noticed the member "look over" and will more likely be utilizing this as the purchase gets closer. Duh! Sorry for the mixup on weight vs price! Yes, the prices you mention are certainly adequate and in line with what you want. Just keep looking and the right unit will show up. The way to check for that rear-end sag is to have someone jump up and down on the bumper while you stand a little distance off and watch for a flexing in the body rather than a straight, solid line. Flexing is bad. We had a '72 31' that had "elephant ears" in back, indicating that the separation had been repaired, but you still have to check the flexing because it can happen again over time, depending how and who did the repairs. Also keep in mind that until 1974 (? ), gray tanks were not standard, although some were added in custom units. Our 31' did not have a gray tank. We loved the Sovereign, it was very comfortable for us (only two + 3 Dobermans) and had mid-twin beds. We never had trouble with the length, or with our 34' either, in terms of size in a park, but I think Calif may have such limitations in their state parks. Well, that is about the sum total of my knowledge! Keep looking. Okay I am thinking you have a plan and a 31 footer with double bunks and the front pull out you should do well! I agree pay the tv off and keep it and remember the space issue really comes to a point in the teens and the family adventure will bring the best memories you will have! We took the girls to japan twice while in the Marine Corps and it has a special place in our hearts even though Japan was not the best place and I ended up deployed a few times. But you plan sounds well thought out so I say get the 31 footer and go for it! Gotta get busy! Have a great day! Now where did I put those revits? FWIW, my father-in-law towed what is now our 1997 34' (9800# MGW) Airstream with a 1500 series Suburban. I am quite sure his TV setup wasn't as good as yours. With the exception of a couple of State Parks in the North GA mountains we haven't had any length issues. That said, a newer 25-28 (maybe even 30) would serve you well. Look for one that all ready has a twin bed setup, then add a bunk above each and you should be good to go. One feature we have found to be really nice for the four of us (children are 15 & 14 at this point and the boy is taller than I am) is a dinette. It is great to have a dedicated place to eat and when the weather outside is bad, we play board games. Length does not always equal weight (there's a bad joke somewhere in there). Our 34' 1984 International weighs in at 7500lbs camp ready and tows like its on rails. We too got three boys, we added a bunk to the back bedroom running across the trailer making three beds. Comfortable and no "he's touching me" scenario. I probably wouldn't use the Odyssey for full-timing, but for our weekends and holiday trips it's a perfectly adequate tow vehicle. Our 34' 1984 International weighs in at 7500lbs camp ready and tows like its on rails. Are you sure!? I am not trying to be disputatious but the weight seems so low. I looked it up and that particular year seems unclear on the weights of the AS site. It does say that the base weight of the 34' is 6250-6950 lbs. What is strange is that the '85 Sovereign 34' is 7100 base weight with 1800 lb load capacity for a total GVW of 8900 lbs. How does an International compare to a Sovereign? The 34' should be similar with one year between build dates. The point is well taken. The older ones are definitely lighter. Txdxrider, I too would strongly recommend a twin model. You will need floor space. You will find your Airstream. Getting rolling with those 3.42's with the 6L80e is going to be fun. You can pick up z71 springs for pretty cheap on eBay. They're variable vs the linear rate on the base. So they won't sag as much with your hitch weight, blisten HDs should do nicely out back. I'd personally step up to 4.10's or 4.56 with that 5.3L unless you want to put undo stress in your transmission, it will be down shifting a lot and probably won't stay in lockup. I have some experience with that same engine although mine is mated to a 4L80e. Good luck in your search. I thought about changing the gears- but from everything I've read the 6-speed works well with towing and 3.42- unlike the older trans the trans gearing is different. But at the moment there are a lot of possibilities. Yes, I am sure. I don't have the slip here, but that weight is as measured on the scales, this spring at the beginning of the season. 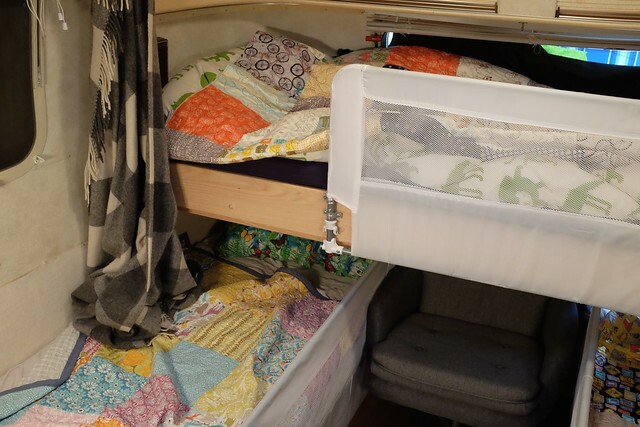 The interior of that trailer is full of weight saving measures, for example all the furniture is aluminum framed, with the wood panels hung from it. The panels are also thinner than in other models. If you google Airstream weights you should find a pdf on the Airstream site that lists most trailer weights from the 1950's onwards. Mine lists as 6250lbs. I do believe that this particular model is the lightest 34' they have ever made. Trans Cooler is going to be the best $80 investment. And very easy to install. 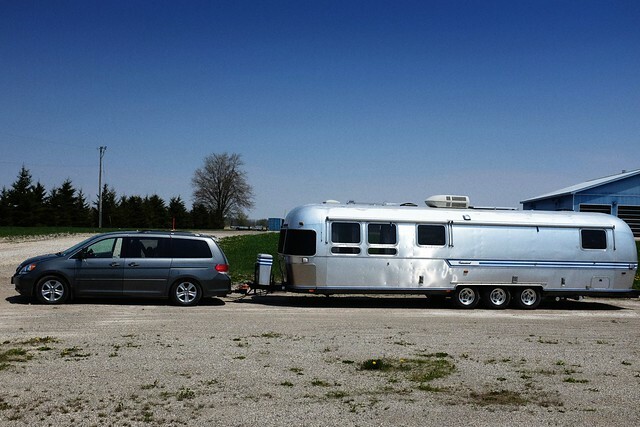 I just wish my current Rig was capable of towing the Airstream we plan on buying. Sadly, the payload and wheelbase just aren't up to the task.